Tom Stoppard makes me feel stupid. Very, very stupid. But he’s funny. Very, very funny. So I forgive him, and go and see his plays anyway. 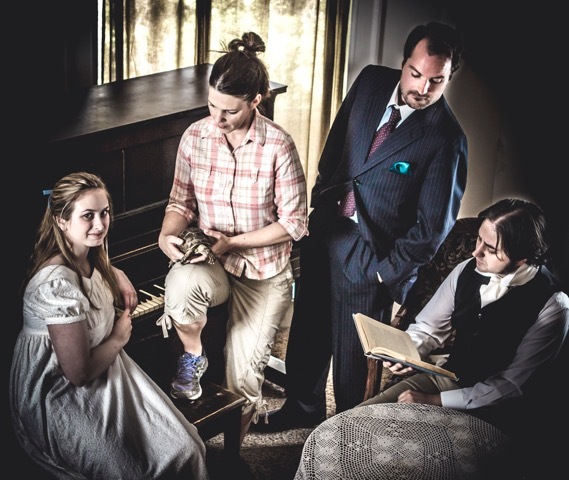 Chameleon Theatre Circle is presenting Tom Stoppard’s Arcadia, and it accidentally ends up being the perfect way to say goodbye to what has been their home in the black box theater at the Ames Center in Burnsville for the past nine years. So, for both those reasons, you should go see Arcadia for yourself. Arcadia is about a great many things (a ridiculous number of things, really), but primarily it’s about time. How bits and pieces of the past insist on continuing to exist in the present, and how people in the present can never full understand the past, anymore than the people in the past can dream of the future that will exist long after they’re dead. Two different timelines exist in the same place in Arcadia. Back in 1809, on the English country estate of Sidley Park in Derbyshire, an incredibly precocious 13-year-old girl named Thomasina Coverly (Mackenzie Diggins) is being tutored by a 20-something young man named Septimus Hodge (Philip D. Henry). (Those are the sorts of names you get in a Stoppard play, there are more…) Septimus gets himself into all kinds of trouble on many fronts, so it’s a good thing he’s so adept at juggling people. He has a tendency to bed down with the adult women passing through the estate, whether they’re married or not. Thomasina being exceptionally smart means he has to keep handing her more difficult math conundrums to puzzle over in order to distract her from the fact that he’s at the center of most of the servants’ gossip. The misdirection is harder to keep going when jealous husbands like Ezra Chater (Matthew Stoffel) keep storming into the room. Thankfully Chater is a wannabe poet and easy to distract with flattery about his writing. Less easily bamboozled is Thomasina’s mother Lady Croom (Dawn Krowsnowski), who runs the estate with a no-nonsense attitude. The thing vexing her at the moment is the estate’s landscaping makeover at the hands of Richard Noakes (Matt Saxe) - who’s also one of the main people spreading the word about Chater’s wife and Septimus. Chater’s wife is pretty friendly. She’s also keeping company with Lady Croom’s brother Captain Brice (Dan Britt), as well as their unseen houseguest Lord Byron. Chater’s wife leads a pretty well-rounded life for an offstage character. The only person not causing trouble would appear to be the long-suffering head housemaid, Jellaby (Danielle Krivinchuk). In 2017 Sidley Park, the descendants of Thomasina and Lady Croom - Chloe Coverly (Nicole Laurenne), older brother Valentine Coverly (Nick Menzhuber) and younger brother Gus Coverly (Cody Madison) - are visited by two guests with competing agendas to uncover the secrets of the past. Researcher and author Hannah Jarvis (Ariel Leaf) is there to learn the identity of the mysterious hermit who lived on the estate (after its makeover by Noakes, which is to include a hermitage). Researcher and author Bernard Nightingale (Andy Browers) is there to prove his theory that Lord Byron killed Ezra Chater in a duel over the reputation of Chater’s cheating wife, and had to flee England because of it. Gus Coverly in the present is mute by choice, instead playing the piano in the next room to express himself. The same actor also plays Augustus Coverly, Thomasina’s very chatty and troublesome brother. Also crossing the line between present and past is a (live) tortoise - stage tortoise Sloth plays the character of Lightning in 2017, and Plautus in 1809. Like all live animals on stage, Sloth has a mind of his own, and is in danger of bewitching all audience attention if his fellow human castmates aren’t careful. Slow though he be, he is mesmerizing to watch. Director Duck Washington has assembled a great team here and they’ve breathed life into a story that’s often a lot of fun. My main struggle is the struggle I have with most of Tom Stoppard’s plays - a lot of the time they seem just a little less than human. They’re brilliant and they’re funny. And in this case you’ve also got the British accents on top of it, which can add to the amusement. But the characters are all dealing with such complex and abstract notions touching on math, philosophy, science, art, and historical research that, as thrilling as it is to have your brain constantly challenged and pinballing all over the place, the humanity underneath starts to get lost. I will freely admit to my eyes starting to glaze over in spots. I expect it’s partly due to the audience’s brains being overloaded with all that Stoppard’s script is hurling at them to process. And it can’t be easy for an actor to learn these lines, as wonderful as they are, wrap their own heads fully around all the concepts, and become so comfortable with all the jargon that it feels like normal dialogue, spoken by a person. That, plus the British accents (a double-edged sword of entertainment and distancing) can make it all seem a bit cold. Just a month ago at the William Inge Theater Festival down in Kansas, I saw a staged reading of Lauren Gunderson’s play Ada And The Engine, about Lord Byron’s brilliant daughter Ada (on whom it’s said Thomasina in Stoppard’s play is partially based). Ada was a woman ahead of her time, transfixed by the idea of what would become the 19th century forerunner of modern day computers. She also was entranced by the machine’s creator, Charles Babbage, a kindred spirit who talked the common language of science and the mind with her - a great but unconsummated affair on both sides. Gunderson’s script was quite literally bursting with emotion and intellect at the same time, and the performances reflected that. It was amazing to watch. Gunderson doesn’t attempt to hit nearly as many targets as Stoppard does in Arcadia. But I think she’s able to dig deeper and find the human guts underneath because of it. Stoppard doesn’t seem as interested in people, or relationships, as Gunderson. The passion for ideas doesn’t reach the heart. So his plays don’t grab me the same way hers do. On some level, this is a failure of intellect on my part as an audience member. I have Stoppard’s script on my shelf. I’m feeling compelled to re-read it now and catch all the things I missed. Having seen actors perform it, I’ll probably get the words on the page now in a way I didn’t before. But the thrill I got watching Gunderson’s play? That doesn’t happen very often. And I think it should. Over and above Stoppard, the cast and creative team, there’s another reason to go see Arcadia in this place at this time. Arcadia is the last time Chameleon Theatre Circle will be producing a play at the Ames Center. A number of factors were involved, but the break happened when the Center objected to one of the selections in Chameleon’s next season lineup. That play happens to be one I saw and quite liked in last year’s Minnesota Fringe Festival. The objections were based on a word in the title and not the content of the show itself, which it seems the Center representatives never saw or read. Rather than change the title, or not do the show, Chameleon decided to find another home for their work. That show happens to be written by the director of Arcadia, Duck Washington. It’s Caucasian-Aggressive Pandas and Other Mulatto Tales, and it will be presented in June 2018 at the Bloomington Center for the Arts as the final production in Chameleon’s 20th Anniversary season. In addition to Pandas, Chameleon will present Lee Blessing’s Independence also at the Bloomington Center in the fall of 2017 to kick off the new season. There will also be the latest iteration of their new play festival in the fall (details TBA). The rest of the season will revisit some of Chameleon’s greatest hits from past seasons, including the musical Chess, and Steve Martin’s comedy Picasso at the Lapin Agile (both at the new Gremlin Theater in December 2017 and February 2018, respectively), and the musical Little Shop of Horrors at the Sabes Jewish Community Center in April 2018. Why am I telling you all this in a review of Arcadia? Because I think in addition to seeing Arcadia, you should make it a point to stand with a theater that stands by their artists and new work, now and all next season as well. If you haven’t seen Chameleon’s work before, this is all the excuse you need to try something new. A lot of theaters aren’t tested like this; and a lot of those that are, cave under pressure. If a theater company stands against ill-informed attempts at censorship, that stand should be rewarded. See Arcadia, see the new play festival, see Caucasian-Aggressive Pandas, heck, see everything. Check their website, mark your calendar.